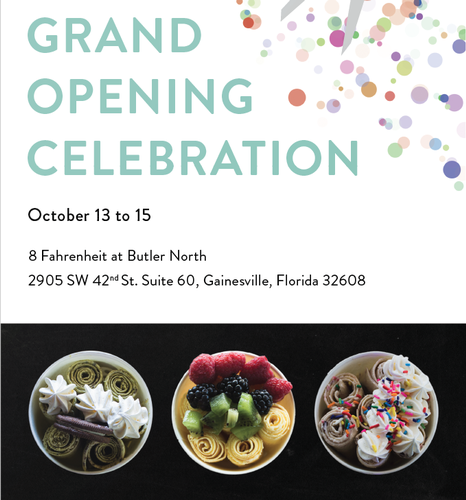 Join us for the grand opening of 8 Degrees Fahrenheit! Inspired by the street vendors of Thailand, 8 Degrees was among the first establishments in the US to pioneer the rolled ice cream concept. Each ice cream is made-to-order on a surface chilled to below -8°F with ingredients of the highest quality and freshness. 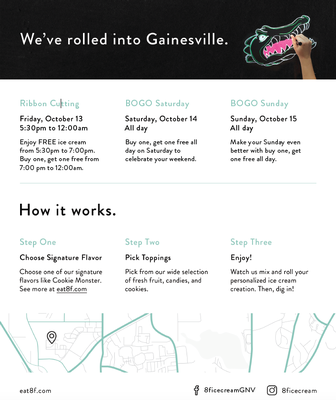 Originated in Atlanta, Georgia, this Gainesville location will be their FIRST Florida store! Come out for this one of a kind treat!